This may seem hard to believe but, there can be beauty in uncertainty. I came across this story that I was given during a training I attended late last year. A child takes the kite to a distant hill and sets it flying high in the sky. 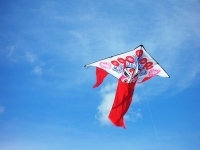 The child gazes at the kite, holding its string in his hand, and as the weather cools and clouds move in, the bright colored kite is hidden by the darkening sky. Still the child clutches tight to the string of his kite above the clouds. Eventually the child grows older and hands the kite on to his child, who after many years passes the kite to his child, and he in turn to his. The certainty of yearning is to feel the tug. When nothing else is clear, and all that we hold dear is hidden from the eye, nonetheless we can feel the tug. In the core certainty of my yearning I am on my way home to my highest self. I loved this story when I first read it. It reflected what I believe to be one of the most powerful tools for healing and growth – the “tug” or the yearning that calls us to be move forward in life towards a greater self. This tug shows up in the therapy room as well. It is usually what brings someone in to see a therapist. They know they have an intention or goal in life, but that goal is perhaps clouded by fear, anxiety, and dread. But there is something that keeps them from letting go. Is it hope? Is it something else? Could it be what James Bugental referred to as intentionality? Using Rollo May’s definition, is the structure which gives meaning to one’s experience. In a way, I see intentionality as the spark, the light that pulls us to find a way to ease our pain or to seek out joy. Seeking out meaning in our lives is what drives us to hold on to that kite string. James Bugental saw our lives as an experience of moving through a long path that tugs us along in our lives. These are intentionality, wish, want, will, action, actualization, and interaction. We sent an intention, such as to lessen our anger or find our life work. The intention is set, it is the kite. The kite is held and led by our wishing and wanting transformation in our life. It is held up by the actions we take to actualize our new way of being. It takes all of these in order to keep that intent alive, or that kite up in the sky. Each of these can help us to hold on despite the clouds of despair or anxiety. We hold out knowing that somehow what we intend will manifest as long as we keep holding on. This is where we find meaning, value and creativity in our lives. When we find it, we hold onto it as hard and as long as we can. When it is lost, we feel the pain and try to find ways to reconnect with it again or at our worse, find ways to numb the pain of our loss. Clients often come to see a therapist because as some left they have lost sight of their own kite. They have lost meaning in their lives. This is what is critical to get across to a client who is sitting in a place of the unknown and even hopelessness. There was something that pulled them there to begin their work to becoming who they see themselves as. That ‘something’ is the tug of the kite. It’s a wonderful story, one that reflects not only the individual journey of how meaning can inspire us but how meaning can lead us to seek the help we need to heal from emotional and spiritual pain.